In this concert showcasing the very best of piano music, a cast of young all-star piano prodigies including: CHARLIE LIU, TAKSH GUPTA and NICHOLAS BUDNY will showcase their incredible talent. Their collective credits include winning Steinway competitions and Golden Key Awards, appearing on the Ellen DeGeneres & Oprah Winfrey shows, and performing for luminaries such as Queen Rania of Jordan & Bono of U2. The second half of the show will feature STORMIN’ NORMAN SELDIN. In his nearly 50 year music career, singer/songwriter keyboardist Seldin has performed at almost every live performance venue out there and is also credited as one of the originators of the Sound of Asbury Park. 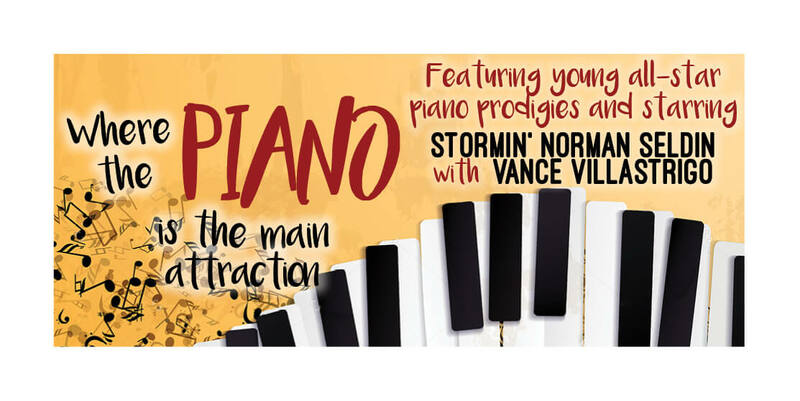 He will perform solo & with VANCE VILLASTRIGO on DUELING PIANOS. From Bach to Rock & Jazz to Ragtime – the keys will sizzle from start to finish!